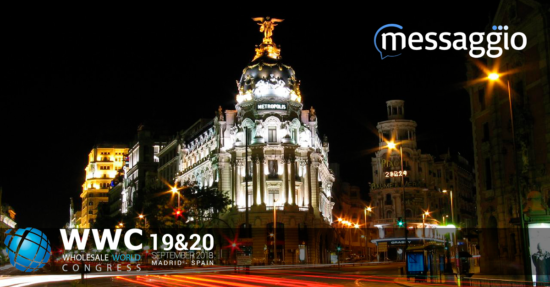 Join Messaggio at WWC 2018 in Madrid! Wholesale World Congress (WWC) is the meeting point for the international telecoms wholesale community. Want to meet with our Team to discuss your requirements of Messaging? Contact us to book a meeting! WWC is an event for the entire industry with participants from all areas of the Wholesale Telecom Industry including Tier 1, 2 and 3 carriers, mobile / wireless operators, ISPs, VoIP providers and technology partners from the voice, SMS, data, satellite, sub-sea and fixed-line markets. WWC has an extensive meeting space is available for all registered organizations, including meeting suites, premium branded rooms, bilateral tables and exhibit booths. The benefits of registration go beyond the two days of WWC with all delegates having the opportunity to use messaging system, the on-line meeting planning and contact system for one months prior to WWC and two months after, which allows delegates to maximize the opportunities at WWC.